I remember my mother raising a Christmas cactus. As a youngster, that particular plant mystified me. Other cactuses I saw in stores and in friends’ homes had thorns. 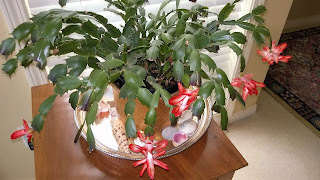 The Christmas cactus had no real thorns, but it had leaves and was easy on the touch. Other “real” cactuses could hurt. But mainly, the Christmas cactus had the habit of blooming (profusely) around Christmas. I observed other indoor cactus plants in bloom occasionally, but never during the darkest days of the year. A few years ago, my wife Lucy and I met with a doctor in the Tacoma General Hospital, where I'd been born decades earlier in the mother-baby unit. On this visit we were in the oncology unit and the doctor was delivering some news following intensive examinations. “You do have a condition of your white blood cells," the M.D. said, "but it’s just at the beginning stage.” He paused, looked me in the eye and said, “You’ll die of something else.” That was in 2008 and I’m thankful not to have died from C.L.L. or anything else. Not yet. But I like to think I'm prepared psychologically and spiritually for death when it comes. On the way out of the oncology unit as we passed the receptionist desk, I noticed some dozen plants lined up on the floor where it met the wall. That seemed really odd. I asked the receptionist, "what's with the plants?" The woman said, “Oh, they’re just extras. They're going in the garbage. Take them if you want them,” she beamed. Lucy and I decided to limit ourselves to adopting just one plant—a little Christmas cactus that caught our eye. Its pot was tiny—about 2 ½ inches lip to lip. As of today, Lucy has nurtured the cactus for about nine years. She replanted it in a larger pot and now the cactus measures 18 inches across. Every year our Christmas cactus has bloomed when daylight hours are very short here at the 45th parallel. It's as if it brings some light into our lives when we need it most. It's a serendipitous fringe benefit of our visit to Oncology. Now the new thing: a year ago this "Christmas" cactus bloomed twice, once at Christmas and once at Easter. And it's doing it again in 2016. So what should we call the Christmas cactus now? That's a question you can ask your younger family members. "If the Christmas cactus got its name for the season in which it blooms, and if it blooms again at Easter, what name would you give it?" I tried this question on my grandkids and they agreed to name it the “Christmas/Easter Cactus.” Logic prevailed! You can see the Christmas/Easter cactus below, just as it appeared on Good Friday, 3/25/2016, getting warmed up for Easter. As everyone knows, at Christmas we celebrate Jesus’ birth and the cactus blooms help add a festive note. On Easter we celebrate Jesus’ return to life—his revival after death by crucifixion. So I went on to ask another question: "Aren't these Easter season cactus blooms like a second life after the Christmas/birth blooms have died and fallen?" They grandkids saw the point and agreed: the Christmas/Easter cactus tells the story of Jesus' life, death, and new life. Not a bad stunt for a tiny plant once headed for the garbage dump. I still don't know whether the Christmas cactus is a true cactus. What I do know is: it's an amazing plant with a message. You might want to try this Christmas/Easter question-and-answer lesson with your younger family members.